You can repeat a label multiple times along long line features such as when labeling roads. The Maplex Label Engine Repeat option allows you to set a minimum distance between repeated labels. The repeated label will honor the location of other labels and features that may obstruct the next label location. Setting a value for Minimum interval doesn't guarantee that a label will be placed at that interval distance, but it will not be closer than the distance. If you are using the Regular placement style for lines, you can specify that you would prefer to have the repeated labels placed at the edge of the visible extent of the map and near junctions where the line features merge or split. These preferences are useful when labeling highways in order to reduce ambiguity. The image below shows the Kennedy Drive label set up to repeat every 150 map units along the length of the line. Specify the Minimum interval size and the units in which to measure (map units or page units-millimeters, inches, or points). It is not guaranteed that a label will be repeated at every interval distance. The interval distance is used as a minimum distance before searching for a position to place the repeated label. Optionally, if you are using the Regular placement style, you can specify Prefer label near map border or Prefer label near junction with a Clearance value in the units set above for Minimum interval. Alternatively, you may want to repeat a label multiple times along a polygon boundary or within a polygon feature. When placing labels using the Boundary placement style, you can use the Repeat parameter to repeat the label along the boundary. To offset the label from the boundary, use the label offset option. The image below shows the boundary labels around Nevada set up to repeat. When placing labels with the Regular placement style and the interior label position options, you can use the Repeat parameter to place the label throughout the feature. The labels will be placed in the outlying fingers of the polygon feature, and then in a grid pattern through the body of the feature. The distance between the labels will be determined by the value set for Minimum interval. 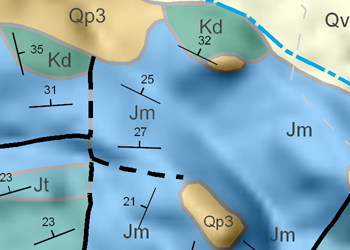 The image below shows the polygon labels from the Upper Jurassic Morrison Formation (Jm) repeating through the geologic feature. Specify the Minimum interval size and the units to measure in (map units or page units—millimeters, inches, or points). To repeat labels along boundaries, choose the Boundary placement style for placing labels. To repeat labels throughout polygon features, choose the Regular placement style and one of the interior label position options.